No anti-anxiety medication is completely safe during pregnancy, but some are much safer than others. The least safe anti-anxiety medications during pregnancy are benzodiazepines, such as Xanax and Valium. They inhibit brain function by enhancing the potency of the neurotransmitter GABA. According to a study published in the November 2007 issue of "Pharmacoepidemiology and Drug Safety," benzodiazepines increase the risk of low birth weight, preterm birth and congenital malformations. 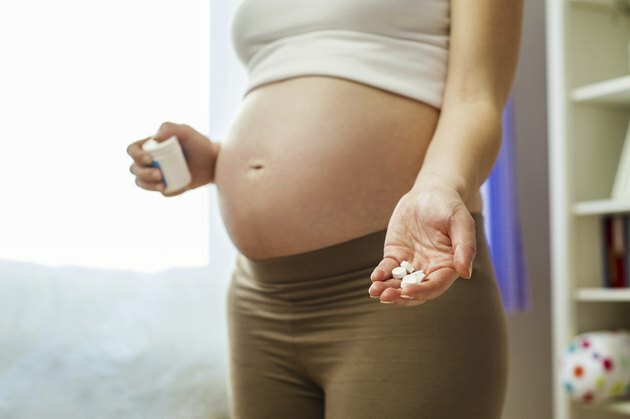 Better choices among anti-anxiety medications during pregnancy include selective serotonin reuptake inhibitors, serotonin agonists and beta blockers. Pregnant women should consult their physicians to discuss available options. Selective serotonin reuptake inhibitors are normally regarded as safe anti-anxiety drugs. They block the re-absorption of the well-being chemical serotonin into the brain's neurons. This increases the amount of serotonin available for binding to serotonin receptors throughout the brain. Stimulation of these receptors controls fear processing in the amygdala, the part of the brain that processes fear. The first systematic study of SSRIs use during pregnancy showed that women who have taken SSRIs while pregnant have healthy full birth-weight infants. However, the average gestational age was shorter than in controls, and the infants had more rapid eye movement sleep, more tremors and less variations in behavior than controls. The findings were published in the February 2004 issue of "Pediatrics." Serotonin agonists constitute a third class of anti-anxiety drugs. The best known and only prescribed drug in this class is Buspirone. Buspirone is FDA-approved for generalized anxiety disorder but not for other anxiety disorders. It binds to the 5-GT1A serotonin receptor, which modulates fear processing. Very little information is available on the effects of buspirone use during pregnancy. The company that produces the drug reports that rats and rabbits who were given 30 times the recommended dose had healthy full-term babies, but it does not cite any studies of the drug in human pregnancy. A study published in the August 1998 issue of "British Journal of Obstetrics and Gynaecology" of 16 cases of buspirone use in the first trimester is inconclusive. The researchers reported 12 healthy full-term infants, one infant with cystic fibrosis, one intrauterine death and two elective abortions. Only the intrauterine death could be the result of buspirone use, but that has not been established. Heart medications in the beta blogger class are frequently prescribed as a treatment of symptoms of anxiety. Drugs in this class block adrenaline receptors on the smooth muscle of blood vessels and the heart. Blocking these sites slows down heart rate, heart contraction and respiration. Because beta blockers only treat the symptoms of anxiety but not the triggers, they are not suitable as treatment options for anxiety that affects the patient on a daily basis. A few of the beta blockers are relatively safe to use occasionally for the treatment of the symptoms of anxiety during the first two trimesters of pregnancy. These include sotalol, pindolol and acebutolol. Researchers have occasionally suggested that beta blockers potentially could lead to low birth weight, but a study of 244 pregnant women receiving beta blockers to control glaucoma and 1,952 controls showed no heightened risk of low birth-weight as a consequence of taking beta blockers. The findings were published in the "British Journal of Ophthalmology." However, all the beta blockers present a risk to the fetus at the end of the third trimester, where they may cause very low blood sugar levels and decreased respiration and heart beat in the fetus.